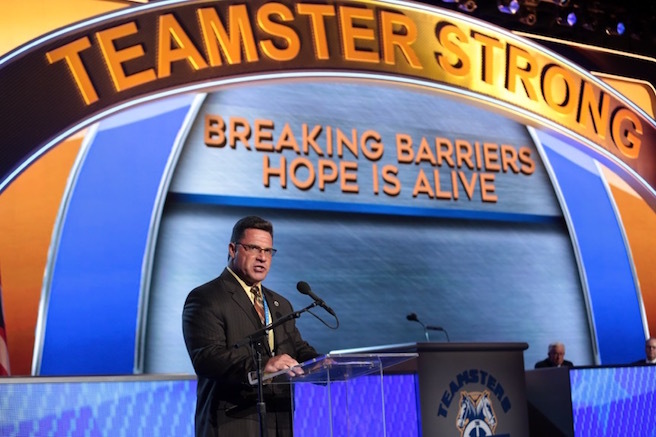 Teamsters have a long history of giving back. But at the 29th International Convention on June 29, members’ generosity was raised to a whole new level when they pledged more than $1.4 million as part of an effort to combat the scourge of opioid addiction. Teamsters Local 24 President Travis Bornstein, along with his wife Shelly, started a charity called Breaking Barriers – Hope is Alive, in order to help families struggling with addiction. Their involvement in the issue is based on their own heartbreak. The Bornsteins lost their son Tyler to an overdose in 2014 after doctor-prescribed medication for an injury led to full-blown addiction. Travis Bornstein addressed the Convention because he wanted Teamsters to know that the misuse of painkillers is a real concern for workers and their families. And in a spontaneous and often emotional fashion, the union responded. Members gave him multiple standing ovations. They shared their own stories of suffering with drug and alcohol issues. But maybe most remarkably, for more than an hour after Brother Bornstein’s speech ended, Teamster leaders from both the Teamsters United Slate and the Hoffa-Hall Slate, regardless of politics, geography or any other differences, lined up hundreds deep and pledged money to the charity on behalf of locals, Joint Councils, Conferences and union clubs. They also donated personally. Teamsters Joint Council 25 pledged $25,000 to the charity. Joint Council 25 Vice President and Teamsters Local 731 President Terrence J. Hancock pledged another $10,000 on behalf of the autism charity In Search of a Cure. Each of the Joint Council’s affiliated local unions throughout Illinois and northwest Indiana made individual and generous donations to Breaking Barriers on Wednesday. The money will fund a drug treatment facility the charity hoped to build in Tyler Bornstein’s honor. The plan is to build it on the current vacant lot in Akron, Ohio where Tyler was left to die in September 2014. Teamsters General President James P. Hoffa was also clearly moved. “What do you say? We have all seen something here about what it is to be a Teamster,” he said. Hoffa then embraced the Bornstein family at the podium. The Teamsters, recognizing the importance of the issue, are set to consider a resolution on the opiate painkiller epidemic at the Convention Friday that, among other things, would call on government at every level to take prescription medication addiction more seriously. Breaking Barriers will also be hosting its first fundraising event on Aug. 21 at Raintree Country Club in Uniontown, Ohio. To find out more about participating in the event or to become a sponsor, go to NowWeFightForYou.com.